A garden or a lawn can increase the value of your property. However, they can also make your property look messy if they are not well cared for. To maintain the curb appeal of your outdoor space, you should probably invest in a garden edger. A garden edger also referred to as a lawn edger, is either a manual or power tool used to manicure the aspect of your lawn and flower beds. There are various types of edgers available on the market, therefore deciding which one is the best is often a hassle. If this is your first time looking for a garden edger, read our guide to find out what options you have and which might be the right one for you. Alternatively, use the links in the table below to have a quick look at the best garden edger tools available on the market. Garden edger is a term that refers to a wide range of lawn manicuring tool, either manual or powered by fuel or electricity. These units have different advantages and downsides, and for this reason, choosing the best for your needs depends on a series of factors. However, before discussing in detail how to choose a garden edger, let’s see which are the main differences between the various units. Manual edgers comprise of a cutting blade fixed on a disc and on a wheel. They are powered by your force and usually require some effort to use. Nevertheless, they are ideal to use around circular pavers or on paths with intricate shapes. These edgers, apart from the effort required to push them, are fairly easy to use. In fact, you’ll just have to place the wheel on a hard surface, such as the edging of a flower bed or the pavement of the pathway, with the blade resting against the edge. Hold the handles firmly and push the footplate with your foot to spin the wheel. Other types of manual garden edgers include the star wheel edger and the traditional spade edgers. Both types are easy to use. Petrol powered edgers usually function on the same principle as the four-stroke petrol lawn mowers. The main advantage of these garden edgers is that they can trim the grass and weeds on the edges of your lawn or flower beds with ease. Petrol edgers also have a long autonomy and you’ll be able to use them on properties of any size. The downside of these edgers is the fact that they need both petrol and oil to function properly. Moreover, they are noisy and need regular maintenance. The corded electric edgers are powered by electricity through an extension cord. They are capable of performances comparable to the petrol edgers but are quieter. Moreover, they need less maintenance, are more environmentally friendly and are more lightweight. The main downside of these units is that they rely on an extension cord. They are difficult to use on large properties and you’ll have to keep an eye on the power cord at all times. On the market, there are not available any dedicated battery-powered garden edgers. However, several models of cordless string trimmers have edging functions and pivoting heads that convert to edgers in a breeze. Moreover, some models are even engineered to be used exactly as the purpose designed garden edgers. Although the edging features are almost always excellent, the main downside of these models is the short autonomy. You’ll rarely have enough power to edge properly a large property, and the vast majority of the batteries will require a long time to recharge. Choosing a garden edger might not be as simple as it seems. Beyond personal preferences, there are a few factors to consider before investing in such a tool. Size of your property: probably the most important thing to consider before deciding which type of garden edger to buy is the size of your property. If you have a large garden or lawn, with many flower beds and pathways, then a petrol edger might be the best for you. Electric edgers, either corded and cordless, are more suitable for small to medium sized properties. Edging shape: the shape of the garden or pathway’s borders is also important. If your edging is mostly straight, then a power tool might be the best option. On the other hand, a manual edger is more indicated if you have many round flower beds or edges with unusual shapes. Budget: your budget is another factor to keep in mind. Manual edgers are more affordable compared to the power tools. However, the latter is more convenient in terms of both efficiency and speed. For this reason, the power tools gained an impressive popularity over the manual options. Check our reviews below to choose the right garden edger for you. 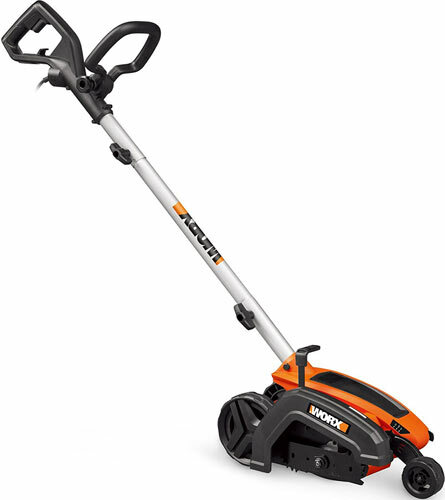 WORX is a popular manufacturer of lawn and garden care power tools. Their line of equipment includes the WG896 12 Amp 2-in-1 Electric Lawn Edger, a garden edger that impresses with its performance and reliability. The 2-in-1 lawn edger is powered by electricity and it comes with a short power cord to attach to your own extension cord. Although dependent on the length of the cord, the edger does an amazing job trimming off the grass and weeds along your flower beds and pathways. The 12 amp motor is responsible for the performance of the cutting blade, which has 3 depth position adjustments. Moreover, the tool has a cutting line indicator that will help you cut neat and precise edges. Another feature we like is the adjustable shaft. The handle, on the other hand, is pivoting to provide a maximum comfort and control to the user. Last but not least, the tool is fairly quiet and easy to handle. Adjustable shaft: maintaining a correct posture while doing the chores is important, and thanks to the adjustable shaft you’ll be able to determine the right height of the handle. Lightweight: the tool is fairly lightweight. The machine weighs 14 pounds and it is easy to hold and handle. Cutting line indicator: cutting sharp and precise edges is crucial if you want to maintain the neat aspect of your property. Blade depth adjustment: the blade can be adjusted in three different positions, allowing you to cut the edges around flowerbeds or along hard surfaces with ease. The edger is less powerful compared to the gasoline tools of the same manufacturer. If you have to deal with stubborn weeds and grass, trimming the edges might be a hassle. BLACK+DECKER has always been a guarantee of quality in the world of the power tools, and things are no different when it comes to garden power tools. A popular edger of the brand is the LE750 12 Amp 2-in-1 Landscape Edger and Trencher, a machine designed to trim the grass and edge your lawn in a breeze. The edger boasts a powerful 12-amp high-torque motor that can easily tackle through overgrowth and create a clean-looking trench. The tool converts from an edger to a landscape trencher easily, with a simple pull of the edge. A feature we like is the built-in cord retention accessory designed to keep the extension cord secure behind the tool. Moreover, the tool is easy to put together, the blade has three adjustment positions and the shaft is also adjustable in height. Brand: BLACK+DECKER is one of the most popular and trusted power tool brands. Their tools are well-built and of high quality. Motor: the 12-amp high-torque motor is powerful enough to deal with all types of grass and weeds that might grow in your garden. Blade adjustments: the blade has three height adjustments, allowing you to make the perfect edges along flower beds or pathways. Cord retention: you’ll not have to worry about the cord getting in front of the blades, thanks to the built-in cord retention system. Cutting a precise edge is rather tricky without a cutting line indicator. If you have a large property and feel that a gas powered edger is more indicated, then a popular model to consider is the Troy-Bilt TB516 EC 29cc 4-Cycle Wheeled Edger with JumpStart Technology. This garden edger boasts a 29cc 4-cycle engine that runs on gasoline and doesn’t require you to mix any gas and oil. The edger is equipped with a Spring Assist Starting technology. This means that it is easy to start with just a smooth pull, and you’ll not have to worry about the tool dying on you before you even start the job. The steel blade is another feature we like. The blade is made of heavy-duty 9-inch dual tipped steel and is engineered to cut clean edges along pathways and flowerbeds. The maximum edging depth is 2.5 inches, but you’ll be able to adjust it to other depths too. Regarding the handling, the edger boasts a fully-molded ergonomic handle that is foldable. Mounted on the handle is a throttle and idle control that makes operating the tool a breeze. Transport wheels: this garden edger is equipped with 3 premium transport wheels that increase the stability and handling ease of the whole tool. Foldable handle: the handle is ergonomic, easy to grip, and foldable for an easy storage. You’ll also be able to adjust its height. Spring Assist Starting Technology: if you’ve owned gas power tools before, you know how hard it can be to start them. In this case, starting the edger is a breeze. Blade: the tool is equipped with a 9-inch dual-tipped blade made of steel that provides clean cuts and precise edging. Although gas powered, the edger is less powerful than expected. Keep this in mind if you have to deal with stubborn weeds or grass. If you want to combine the convenience of two landscape care tools in one solution, then you might want to consider the BLACK+DECKER LST420 20V MAX Lithium High Performance Trimmer and Edger. This battery-powered tool is ideal to both trim the grass and defines the edges of the lawn and other landscape elements. The tool boasts a Power Drive transmission that delivers more power from the motor to the cutting string. In this way, you’ll be able to get the job done faster and with better results. As the tool is both a string trimmer and an edger, it isn’t equipped with a blade but with a nylon string. The automatic feed spool ensured a continuous working length without bumping, which is convenient, and the manufacturer proposes a line of accessories to use instead of the string. The system is powered by a 4.0 Ah battery that should provide enough energy for up to one hour of continuous trimming or edging. Moreover, you can choose the purchase package with two 2.0 Ah batteries, which provide the same autonomy but more convenience. 40V MAX System: the edger comes with a 40V MAX battery which is compatible with all power tools from the same line. Purchase options: you can choose the tool with two 20V batteries, so you’ll be able to have a charged battery each time you need it. Feed: the trimmer uses an automatic feed spool that feeds the line when needed, without bumping. Runtime extension technology: the dual mode accelerator switch allows you to choose between high performance or longer run time. Because this tool wasn’t designed as a dedicated edger, it requires the users to hold it in an awkward position when used in edger mode. If you already have a string trimmer with a detachable shaft and are looking for a cost-effective solution regarding the edger, then you can consider the edger attachment Poulan PP1000E 7-Inch Pro. This garden edger boasts a heavy-duty gear box and it is compatible with almost all major brands of trimmers with detachable shafts. This means that you’ll not have to have specifically a Poulan power tool to use this attachment, which is great. Installing the attachment is very simple and it only requires a click. Regarding the performances, the edger boasts a rugged 7-inch hardened steel blade capable of neatly cutting an edge around a flower bed or pathway. The attachment also has a barrier handlebar designed to protect the user against accidents and it comes with a limited two-year warranty for labor and parts. Compatibility: this garden edger attachment is compatible with Poulan PP336, PP036, PP13, Pro PPB100, PPB300, Craftsman, Ryobi, Weed Eater, Homelite, Snapper, and John Deere multi-tool attachment systems. Cutting depth adjustment: the edger has various blade adjustments and can cut edges to a depth of 2 inches. Easy to install: the edger attachment is easy to install with just a simple click, and it is backed by a 2-year limited warranty. Heavy-duty gear box: the attachment boasts a heavy-duty magnesium gear box that resists to heavy use for a long period of time. The shaft of the attachment is rather short, and this might be an issue for taller people. Because of its popularity and characteristics, we believe that the best garden edger on the market is the WORX WG896 12 Amp 2-in-1 Electric Lawn Edger. This power tool is lightweight, easy to handle, and perfect to use on small or middle-size properties. It is powered by a 12Amp power cord and although it needs an extension cord, it provides great results even on the most stubborn types of terrains. Some of the most noteworthy features are the adjusting cutting depth, the cutting line indicator, and the height-adjustable handle. We also have to mention that the handle is pivoting and easy to turn in any position. Compared to gasoline edgers this tool might be less powerful, yet it is environmentally friendly and quieter. As an overall, we really like its performance and believe that it really deserves a chance. Your web site offered us with valuable info to work on. You’ve done a formidable job and our whole community will be grateful to you.